The Homespun Players are incredibly proud to announce that our Shakespeare in the Park Festival for 2016 has been sponsored by the City of Riverside! Join us for a day of Shakespeare! His works were meant to be heard and experienced, by everyone! He wrote to an audience that was accustomed to listening, rather than reading. Once you see Shakespeare performed, his stories come to life and are easy to understand and it becomes clearer why his works have immortalized him. 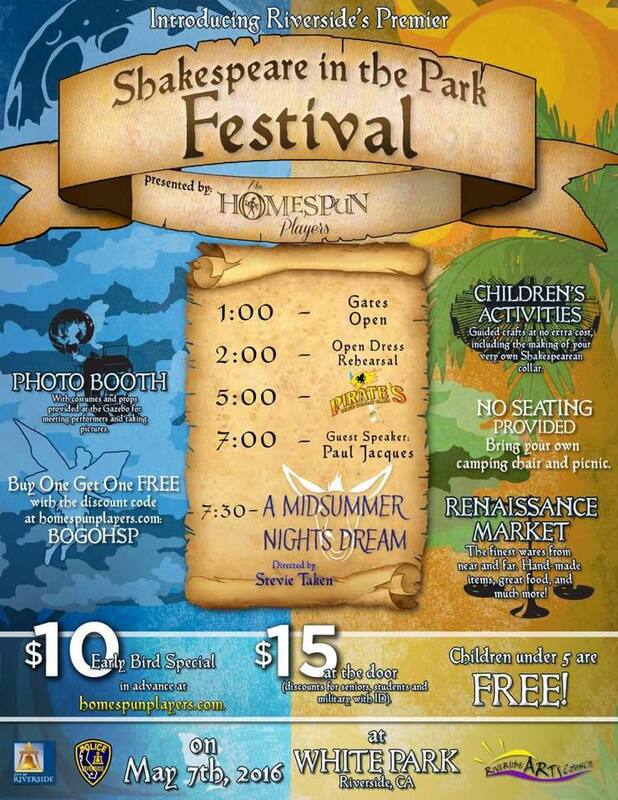 The Homespun Players are bringing Shakespeare to life in Riverside’s 1st Annual Shakespeare in the Park Festival! With two performances, live music, interactive booths, and local vendors, we intend to demystify and spark a love for our favorite playwright with a production of A Midsummer Night’s Dream. Stay tuned for more information as it becomes available. We will be posting our schedule, and additional information here!